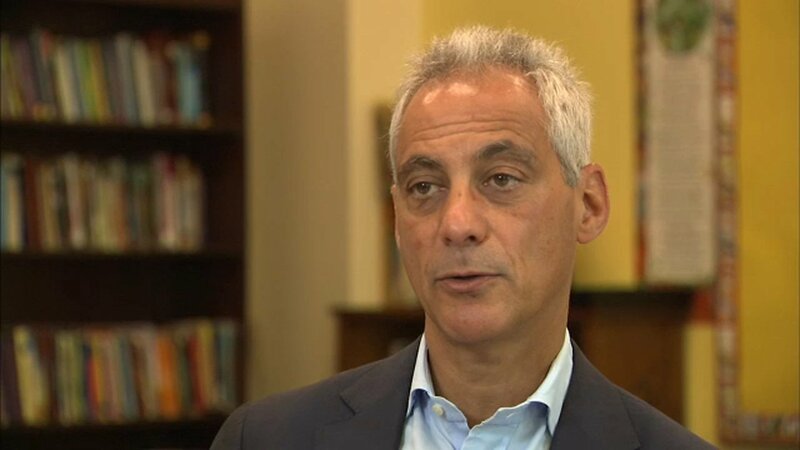 CHICAGO- With the start of the school year just around the corner, Mayor Rahm Emanuel is once again touting educational gains for Chicago Public Schools. It's part of a concerted effort to try and change the perception of CPS. Chicago Public schools once bore the label of the worst public schools in America but recent gains, show the city is making progress. "All the arrows are pointing up," the mayor said. He has been rolling out statistics the past ten days and holding one news conference after another. Today as he cut the ribbon on a new wing at Byrne Elementary he was touting that more than 46 percent of CPS graduates had earned college or career credits, up 50% since 2014. Earlier this week he reported that 56.6% of students met or exceeded the national average in math scores and that 61.4% did in reading scores. Then there was the record low dropout rate 6.4% in 2018 and record high graduation rate 77.5% from 2017. "These are milestones not end points and they're ways of measuring the progress, but then saying okay, what more do we have to do," Mayor Emanuel said. A recent Stanford University study concluded CPS students' scores improved more from 2009 - 2014 than the average scores of all students in the US. "Probably the biggest gains are being made in reading and math are among Hispanic students, not among African American students and we have to double down and make those kinds of investments so they catch up," Emanuel said. The mayor's own kids have all graduated from private schools. I pressed him whether CPS would be good enough for them now. Craig Wall: "But the question is, are schools were you want them to be?" Wall: "If that was an option you might consider CPS for your kids? Emanuel: Again I want to say my job as mayor is for taking care of Chicago's children, my children are Amy and my responsibility we'll make the decision. I don't really think that's the question." The mayor also expressed frustration with media coverage of educational gains during this political season. "If it dropped by the percentage it's going up I guarantee it would get a lot more coverage and that's really a question to you guys. Be objective. If it goes up just report it, if it goes down report it," he said. Wall: "Do you want your legacy to be education? Emanuel: "Well, I ran because of that. But it's not my legacy because it's actually the kids' future, that's how I look at it." A co-director of the grass roots education group Raise Your Hands says statistics don't always tell the whole story and people should evaluate them with a grain of salt in this political season. While schools may be improving, the question still remains are they good enough? The election next year may provide the answer.